Figure A93. Yukon anomaly, interpreted as the Yukon slab, with (horizontal) [vertical] cross sections through (A)[D] the UUP07 p-wave) and (B)[D] the combined SL2013 and S40RTS s-wave models at 330 km; C) the location of the modern geological record that we interpret to have formed during the subduction of the slab. The Yukon anomaly (Figure A93) is located below northwestern North America and is within the upper part of the lower mantle. Previously, van der Meer et al. (2010) interpreted it to be part of the North Pacific slab. By closely examining the tectonic evolution and upper mantle structure of the region we have now prefer an interpretation that these are separate slabs. 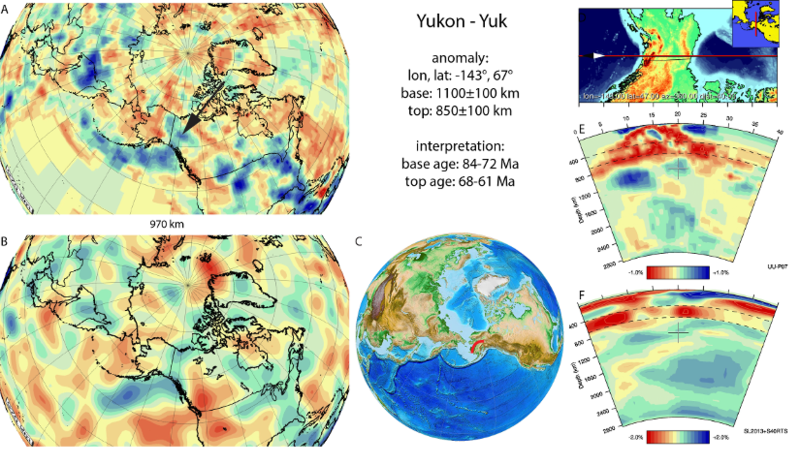 The Yukon slab is E-W trending, and at ~900-1100 km it connects to the SW-NE trending North Pacific slab. The location of the slab is in agreement with the location of the Upper Cretaceous-Lower Tertiary continental margin Kluane arc in the reconstructions of Nokleberg et al. (2000) and Shapiro and Solov’ev (2009b). We prefer this connection over the previous interpretation of van der Meer et al. (2010), which was based on an older reconstruction of the paleo-Pacific Ocean of Engebretson et al. (1985). (Trop and Ridgway, 2007) infers that the Kluane arc is of Campanian-Maastrichtian (83-66 Ma) age. In the Late Maastrichtian- Early Paleocene (68–61 Ma) the continental margin was uplifted and a regional unconformity developed (Trop and Ridgway, 2007). We consider this the best estimate for the moment of slab detachment and use this to infer the age of the top of the slab.